Back in June, I made a mini-quilt that I entered into the Project Hope online quilt show. Life was a little hectic at the time, and as it turned out I never talked about the finished piece here. The labyrinth pattern I used in that project is one I drew up myself. I mean, the basic maze design in it is ancient, but I drew it out on graph paper and then traced it in sharpie and scanned it, then spent a kajillion hours cleaning up the scan in GIMP. It occurred to me about halfway through the cleaning-up part that I really didn’t need to do this in order to have a usable embroidery design. But it made me happy to have a prettied-up version of it. 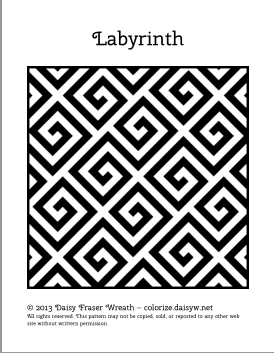 The other day while I was thinking about making another version of that labyrinth, this time in a different stitch, I decided to go ahead and make up a PDF version of it. 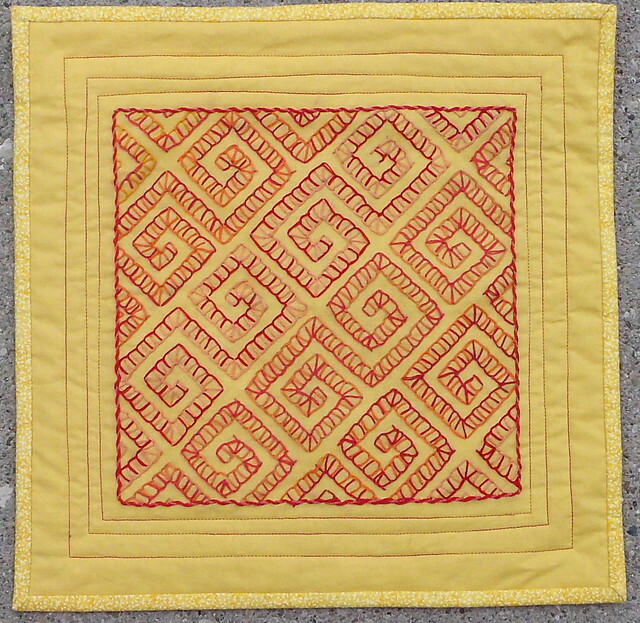 The one I did on the mini-quilt is double blanket stitch, and I think I’d like to try a version with double rows of palestrina stitch, or maybe interlaced herringbone with beads.